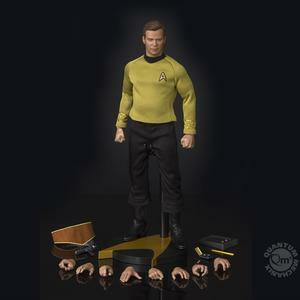 To celebrate the 50th anniversary of Star Trek™: The Original Series (TOS) this year, QMx is bringing everyone's favorite captain to Trek collectors everywhere with our Master Series articulated figure line. The most renowned Starfleet captain in Federation history, James Tiberius Kirk, commanded the starship Enterprise on her original voyage. Our 1:6-scale figure re-creates this iconic character in exquisite detail. 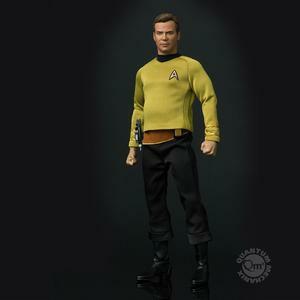 Standing approximately 11.5 inches tall, every element, from his 23rd century tunic to his custom black boots, is authentically reproduced. The original portrait sculpt of William Shatner as Kirk was personally approved by the actor. -Fully Articulated Body: More than 30 points of articulation allow the figure to be displayed in multiple dynamic poses, approximately 29 cm tall. -Realistic Portrait: Lovingly rendered by a top artist, this is a perfect likeness to James T. Kirk with realistic wrinkles and skin texture. Each head sculpt is specially hand-painted. -Boots: Using leather-like material cut in the original style of the footwear worn in Star Trek™: TOS these boots zip up on the inside.